Data obtained by the Associated Press shows that tens of thousands of similar safety defects were found when government inspectors checked the rail lines used to haul volatile crude oil across the country. The defects included rails that were worn, bolts that were broken or loose or missing, and steel bars that had cracks.Such flaws are not uncommon across the nation’s 140,000-mile freight rail network. 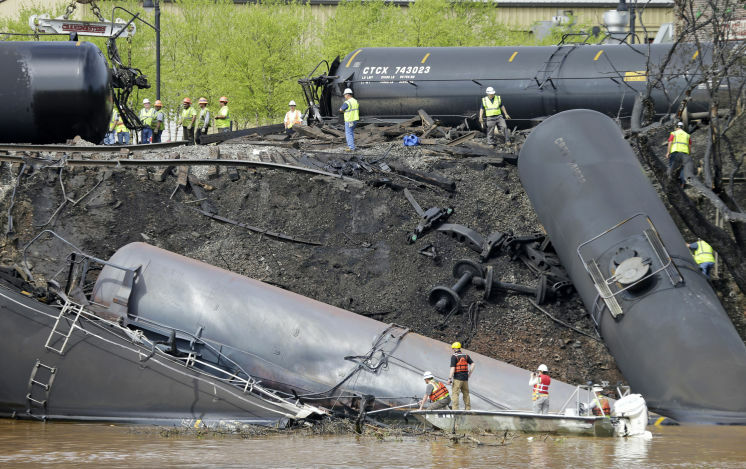 But these nearly 24,000 imperfections drew heightened attention because of a surge in recent years of domestic energy production that has increased rail shipments of oil and the number of major derailments.The inspectors also noted failures by railroads to quickly fix problems identified through inspections.A former senior official at the Federal Railroad Administration said the findings reinforce the need for railroads to stay on top of regular maintenance. As with pipelines, it’s not IF, it is WHEN will a spill happen.